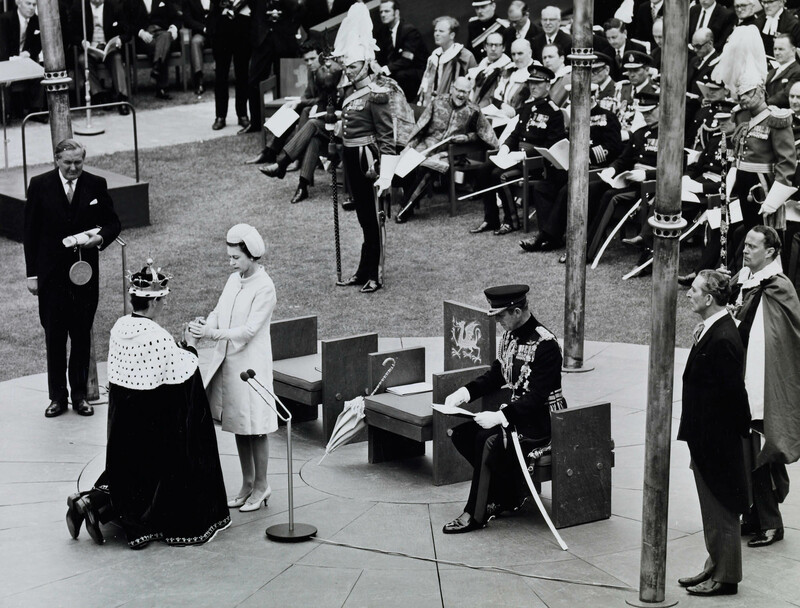 Unknown Person - The Investiture of HRH The Prince of Wales at Caernarfon Castle, 1st July 1969. The Investiture of HRH The Prince of Wales at Caernarfon Castle, 1st July 1969. Photograph of Prince Charles of Wales (b.1948) kneels in front of HM Queen Elizabeth II (b.1926) his hands between hers, during the Investiture Ceremony at Caernarfon Castle, North Wales. The Prince wears the Coronet and mantle. The Duke of Edinburgh (b.1921) seated on right and the Home Secretary James Callaghan (1912-2005) standing on left. This image was used in 'Charles Prince of Wales A Birthday Souvenir Album' published in 2008. During the Investiture ceremony, after The Prince of Wales had the coronet and robes placed on him, he pledged his allegiance to The Queen with the words: ‘I, Charles, Prince of Wales do become your liege man of life and limb’. The photograph above shows this moment, the Prince’s hands clasped in The Queen’s.